I can’t believe it is November!! Every year I think I am going to be more prepared and have Christmas shopping done and gifts made for friends and family by now. It NEVER happens!! 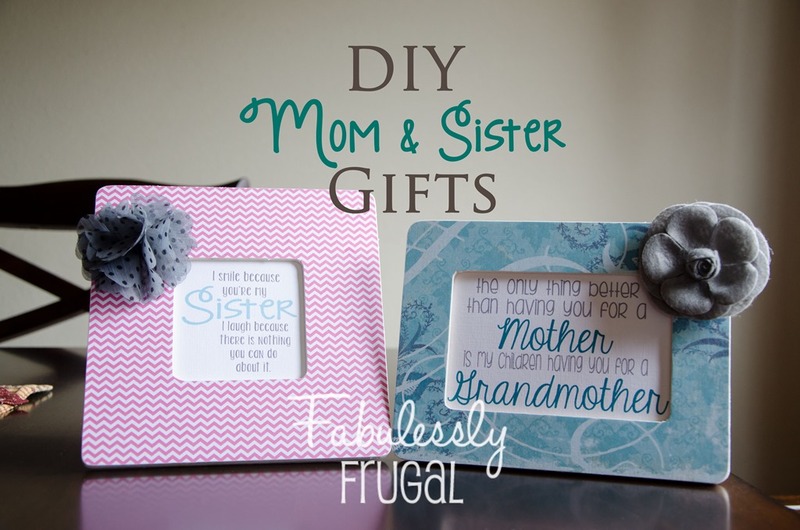 Here are a couple of quick and easy gifts you can make to give your mom and/or sisters. Download your Free Printables here and print them out I made an assortment so hopefully you can find one that works for you! Brush a thin layer of Mod Podge on the frame. Don’t put too much or it will cause the paper to bubble! You can always spray pain the frames if you don’t want to go the paper route. That is even easier and you can mass produce a LOT that way. Place the paper on top of the frame and rub it with your hand to smooth it out. I always place it face down while it dries. Once it is dry, use your sanding block, sand downward. I go around the frame and fold all the edges down before I sand. The paper comes off really easily and it looks perfect. Cut an X in the center of the frame. These Cutterbee’s are my favorite scissors ever!! If you have a crafter in your life, these make a GREAT present. You can find them here. They are super sharp and have a nonstick coating. After you cut your X, fold down the sides. I use a big nail file to sand off the edges inside. You can use your sanding block, it is just a little awkward. Now you need to print off your FREE printables. Go here to download the ones you want. They are saved as jpegs. I just opened a blank page in publisher (or word) and put them on the page and printed them out. You can fit 4 square ones on a page or 2 square and one rectangle as above. I used the backing as a guide to make sure I didn’t cut the print too small. If you don’t have a paper trimmer, this is my favorite one. I’ve had it for probably 10 years and it is awesome and the blades are cheap to replace and easy to find. Place your print in and then the cardboard backing behind it. It gives it stability. I felt like they needed a little something more. I found these cute flowers on clearance at Michael’s and they were the perfect touch. I have 3 sisters and we are all kind of crazy and thought this was a fun quote to give them. Now go make something for the women in your life. You could always pair it with an inexpensive necklace from Amazon, I got this one and love it and always get lots of compliments when I wear it. You can find it here. It is $1.10 and ships for FREE!